Imagine technology that doesn’t tear your family apart, but instead brings you closer together. Imagine technology that doesn’t interfere with your child’s education and development, but encourages it. This is the mission of Pai Technology. Creators of engaging STEAM products using augmented reality, Pai Technology is a company dedicated to creating new lifestyles for families by using technology to help kids grow, develop, and play. Some of the award winning products Pai has to offer include PaiStorybooks, which use Augmented Reality technology to create a unique interactive reading experience; Ocean Pets, a virtual aquarium; and Augie, the first premiere coding robot that is equipped with augmented reality technology. Pai Technology products are designed to help children grow, develop and play by turning screen time into learning time. Change their world, one play at a time. Tryazon will select 60 hosts for this opportunity. Those chosen will receive a party pack with a variety of Pai Technology products to showcase and sample with friends and family! Learn more about the products and party by clicking the tabs below! Pai Technology, providers of engaging Augmented Reality STEAM experiences, combines the latest advancements in technology with research to make innovative and fun educational products. 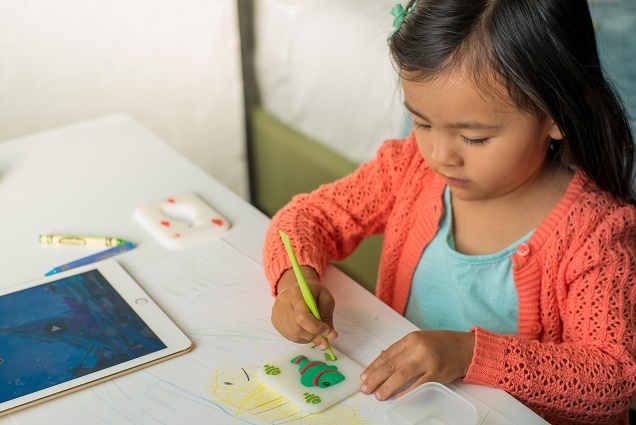 Technology that excels in pairing children’s development with technology, science, and art, Pai Technology’s products strengthen the imagination, encourage problem solving, and promote critical thinking. Learn more about Pai Technology products HERE . Get to know Pai Technology! Encourage the love of reading with an interactive, auditory and visual experience! With TJ and the Beanstalk, reading comes to life! Powered by code. Fueled by Fun. Pai Technology's Augie is the first premiere coding robot that is equipped with augmented reality technology. Developed to introduce children to coding language, Augie engages imagination and creativity while helping children further enhance critical thinking and problem solving skills. Playtime with Augie also improves hand-eye coordination and logic through the introduction of play patterns that leverage artificial intelligence and innovative robotic technology. Augie comes with a FREE intuitive app that offers engaging coding tutorials, all in conjunction with standards set by Code.org, and exciting gameplay. Augie runs on code fueled by fun for endless hours of play! Use #Tryazon and #PlayWithPai and to include your tweet on this page! The fun begins in July, when parties will be hosted! Tryazon will select up to 60 hosts for this party.